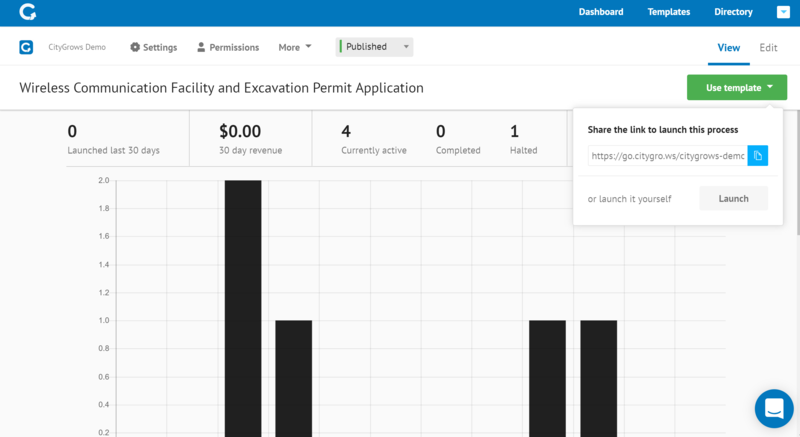 There are two different ways to launch a CityGrows process: internally via your dashboard, or externally (the way a constituent or business will) via a link or your organization's public portal. All it takes for anyone to launch a CityGrows process is access to a link. 1. Navigate to the View tab on the process template page. 3. Use the blue "copy" button to grab the URL, then share that link to allow access to the process. (If you don't see this link, make sure the Publicly launchable toggle is switched on under Settings). Any process that is set to Publicly launchable will automatically appear in and be launchable from your public portal. Processes are usually launched internally when they don't involve an "applicant" or someone outside your organization. This might be the case if you're managing a purely internal process like a Human Resources process. If the process is private, it will only be launchable by users who are already set up as admins (and the same is true for processes that haven't been published). To launch a process internally, visit a process template and click the launch button in the upper right-hand corner of the View page. If you don't see the launch button, you probably need to publish your process first! Only users who have access to a template can launch them internally.